Tight on your outfitting budget. Here is an idea showing Restrooms Share Hand Sanitizers that can save you one complete Sanitizer Station. 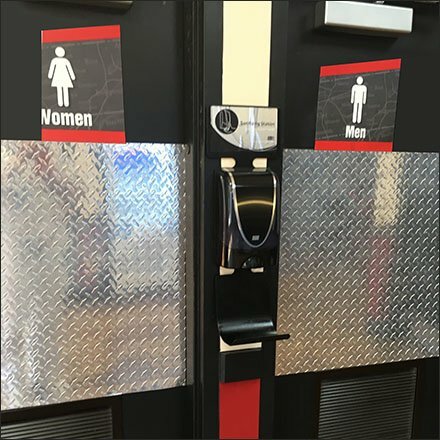 Both Genders have equal access to hand cleaner, before and after leaving the facilities. Note that such a deployment probably will not cut back on actual sanitizer consumption, and may require more frequent filling, but an economical idea is an economical idea, wherever seen.